We value the opinions of our customers and we're proud to share them with you! I wanted to let you know that yesterday was the best day of my life!! Everything about the wedding was perfect - I was blown away wen I saw the bandstand setup and then the reception marquee. The way the marquee was connected to the gallery and the space created with everyone flowing from the dance floor to the bar room and the well room for photos and chilling out was perfect. I cannot thank you enough for everything you did. You went above and beyond and it was spectacular. I wouldn't have changed one thing and all your advice and help and support made it happen. Due to the damp weather we shut shop a little early and by the Claire left at 4:45 the breakdown team had not yet arrived. I hope they found everything as we left it. Once again a huge thank you for being ever so obliging and accommodating our every request. I hope this finds you really well. I know we Whatsapped just after the wedding but I wanted to send you a proper thank you for everything you did to make our wedding day so special - we have not stopped talking about it! From the very start you were nothing but professional, responsive and helpful; despite the extraordinary amount of emails and questions I felt like we were asking you seemed endlessly patient. 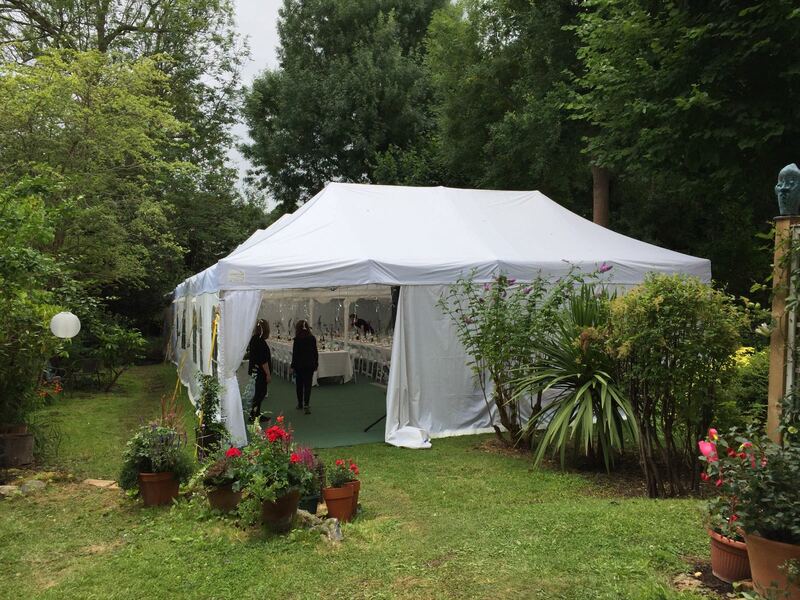 Your advice was also invaluable; helping us to think through what we would need, where the marquee could be positioned, how guests would enter and flow around, whether we were making the tables to squished together, the size of the dance floor...everything. Because we didn't have a wedding planner it was a steep learning curve for me and I really appreciated when you explained everything in such a detailed way - giving me the exact measurements of the marquee and tables so I understood why you were suggesting particular layouts etc. In the end the setup was exactly as I had hoped; and in fact probably even better. I think having the marquee up against the pump house with the doors open to create one flowing space was absolutely perfect and so glad it worked since this hadn't be done before! 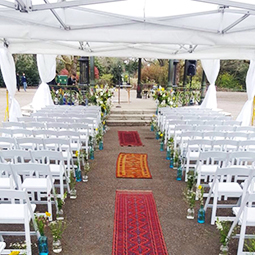 Also, on the rehearsal day when it was absolutely freezing and the ground flooded and you patiently suggested putting sides on the gazebos and getting a heater I really appreciated all that. If you hadn't acted like everything would be fine I might have panicked since the weather ahead of the day was so hideous (I did panic a bit after you'd left!). Getting us the heaters when Draz ordered them just the day before was also incredible; thank you. 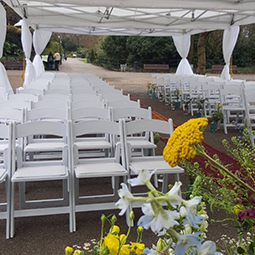 The whole setup; both at the bandstand and the PHG was so much more beautiful than I imagined - thank you for all the effort you put in. We actually went for a walk in the park the next morning to have a last look but everything was gone already! Your team must have worked so hard so please thank them from us. All the best and thank you once again - I will be sure to recommend you to all my friends. 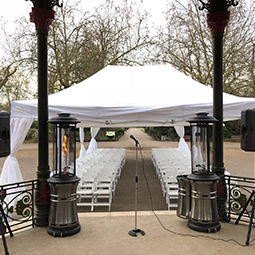 Ro & I would like to thank you both – and your excellent delivery & collection team – for all the help you gave us with the marquee for our wedding. Thank you Jonathan for coming to see us and for your invaluable advice before the day, your expertise and knowledge was hugely reassuring to us. The team doing the set up & strike worked so hard and had such good spirits – they are a real credit to Casablanca, please pass on our thanks. 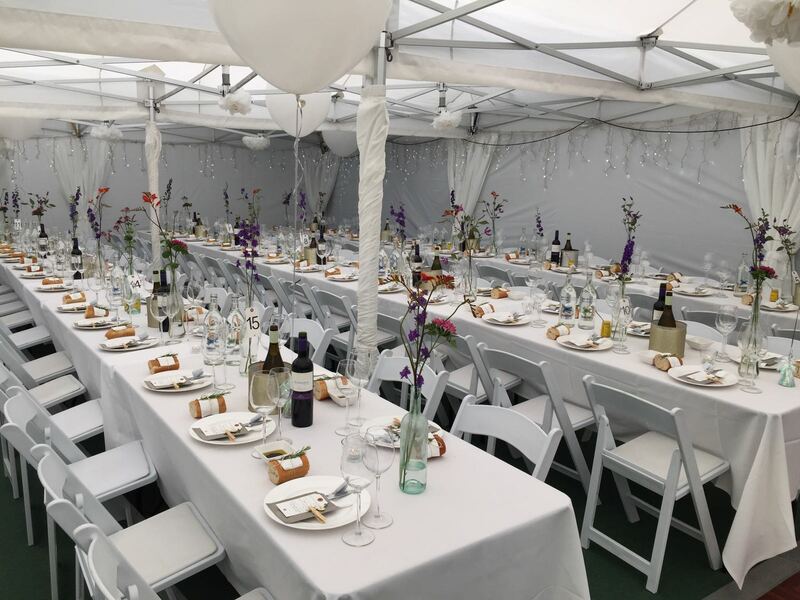 On the day, the marquee and garden looked fantastic – everything we could have hoped for and, although we had fears of a Glastonbury type scenario and having to ask everyone to bring their wellies, it didn’t rain (hurrah!). I’m attaching a few photos. Thank you for everything you did to contribute to us having a completely wonderful day (we are just about returning to earth). A funny note to end on .... I’ve just had an enquiry from Esther Shaw for a garden party in September. I said to her “I can highly recommend a good marquee company if you are looking for cover” - gave them your name and she said “they’ve just recommend you”! If Casablanca ever need some catering for an event please let me know and I will try and match your good-will and generosity. Thank you for being so patient and calm in sorting out my complicated order just now. I know that it wasn’t a big order but it is important to me and my company and I am really grateful that I found someone so intelligent to speak to about it and who was determined to make it happen. You are a very good advertisement for Casablanca Hire. What an amazing company you are. We can not thank you enough for every little thing you’ve done for us and the families of Grenfell. The marquee & all the items you have provided looks beautiful. The two guys that came yesterday works so hard & professionally. We’ve had some surprises ourselves this week when the royal highness himself donated all the Christmas decorations with a ton of food along with a request for photographs of the event set up. I trust that you will be happy for your name & picture of the company logo to be sent to him? Please let me know if not. The pride of Britain & other medias have requested to attend & would like to cover the event. We have forwarded them a list of sponsors which they would like to print & show on a wide range of things. Jonathan, thank you so much for for time & patients helping us to visualise what is now more amazing than we ever thought would be. The pastors have requested 2 people from your company to join us on Friday at the event starting at 6pm. We have many sponsors coming & would be delighted if you could join us. Super – thanks Mary. And please thank the team for the excellent service! Thank you all so very much for everything - the marquee looked amazing And even though the weather was artic it was lovely and warm!!!!! Many many thanks again! Ps Marcos and his team were nothing short of amazing! Thank you Jonathan, the marquee was fantastic!! Thank you so much for yesterday and getting in everything so smoothly. The client was over the moon!